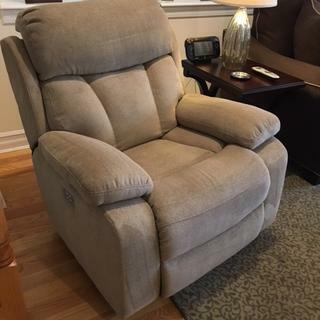 L: 39" x W: 40" x H: 41.5"
Connell Power Rocker Recliner If you're looking for something comfortable and good looking, the Connell power recliner has you covered. This chair offers power reclining seats and a power headrest to keep you comfortable for a pleasant package of style and coziness. If you're looking for something comfortable and good looking, the Connell power recliner has you covered. This chair offers power reclining seats and a power headrest to keep you comfortable for a pleasant package of style and coziness. Fully reclines with 14.5" wall clearance. We are very happy with our purchase of the lounge chair! We are thinking about returning to look at the matching love seat in the near future. My husband loves it! Happy that it rocks and reclines! Purchased two of these recliners recently and we are so happy that we did! So very comfortable and the fabric is beautiful. I would highly recommend! This is the BEST piece of furniture in my home! absolutely love this chair. It is comfortable and I easy to use. If you are about to have any kind of surgery, this is the perfect recliner to sleep on. it replaces the use of a bed and makes it much easier to recline and get up. I've been through 2 surgeries including a shoulder surgery and even though my prior chair did a good job of getting me to recline, sleep and get up, this recliner is even better. It's absolutely the best! Great chair, just have to get used to it not being a manual recliner. I love being able to put it any position and it staying. I also like that the headrest can be adjusted also. Very comfortable well made; plus it has a USB charging port now I can plug my phone in while i'm relaxing. Great Chair, the price is right! Love my new rocker-recliner! It is very comfortable and I love the USB port...very handy! Recliner makes all kinds of noises when you rock in it and doesn’t appear to be very sturdy. We have someone coming in 2 weeks to take a look at it. Does anyone have this chair with cats? The salesman told me it would withstand cats but the first day I see damage from back claws. BEST ANSWER: Hi Deborah! We're sorry this has occurred and would love to see how we can help. If you could please email us at rfcare@raymourflanigan.com with your order, contact information and a copy of your concerns we can better assist you. Thank you! Hi Deborah! I do not have cats. I would not recommend the chair if I had one. Bought the chair back within the last 3 months and noted a pull on the arm recently.However I do like the look and comfort of it! I used to have a cat but not now. Sorry.